Wayne Adams and Catherine King, two artists living in Tofino, Canada, couldn’t afford to buy a house of their own. Instead, they took their assets offshore — literally — and created a floating paradise off the coast of Vancouver Island called Freedom Cove. For over 20 years, they’ve been living off-grid on this brightly-colored collection of buildings and rafts. Weighing in at 500 tons, the complex is complete with five greenhouses, a two-story house, a dance floor, and a lighthouse. The couple rely on solar energy and rainwater to meet most of their needs. They even raised two kids here. The closest town is an hour’s boat ride away — but if it’s too cold to go outside, they can open up a door in their living room floor and catch fish from the couch. Adams and King’s home may not look very futuristic, but they’re pioneering a new form of habitat called seasteading. The word seasteading generally refers to permanent human habitats on the ocean, particularly those in international waters. Some libertarians see them as a way to create new countries beyond the reach of any government. But what if that’s that’s the wrong reason to try seasteading? After all, Elon Musk isn’t developing SpaceX rockets in order to create a Martian utopia. For him, it’s about “being a multi-planet species and a true space-faring civilization.” It’s about exploration and humankind’s survival. What if we used seasteading technology not to escape the shackles of earthly government, but to ensure that our species can survive the worst impacts of climate change? What we used it to learn more about our planet and create more sustainable lifestyles? Sean Ironstag wants to clean up the Great Pacific Garbage Patch with a vessel that would convert plastic into floating islands by way of a 3-D printer. A company called Blueseed worked on establishing a tech incubator on a cruise ship anchored in international waters off of the San Francisco Bay. Ambitious seasteading advocates could team up with an island nation or a country at risk of losing territory to rising sea levels. That’s what’s happening with the Floating City Project being developed by the Seasteading Institute. After years of setting their sights on international waters, the group has shifted its focus to working with the government of French Polynesia to support the project. Building a seastead closer to the coast would be easier both in terms of weather conditions and the legality of the project. 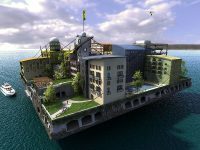 The Institute has invested in architectural renderings and feasibility studies to learn what kind of seasteading community would be possible, and they believe that a city at sea could be ready for development by 2020. But if they build it, will anyone come? A survey of people who are interested in living at sea showed some surprising results: people from over 60 countries expressed an interested in living in the Floating City. And a third of the respondents were college-aged millennials who liked the idea of pioneering a new form of living — as long as there would be decent medical care and reliable Internet at sea. Surely populating a seastead would be easier than starting a colony on Mars. What would this community look like? An artist’s rendering shows a seawall surrounding the community to protect against large waves. Inside the ring are dome-shaped greenhouses and multi-story apartment complexes on platforms that can be moved by tugboats. Apartments would average around 600 square feet — about the size of a tiny house — and cost $500 per square foot to build — about the same as building a house in San Francisco. Seasteading will be expensive at first, but it may soon become a necessity. As urban populations continue to grow, coastal cities may have no choice but to expand outward. Some nations are already working on plans to keep their cities functioning in the age of climate change. Floating pavilions aren’t just for people, but for plants too. Cities in need of more agricultural land could make use of the solar-powered greenhouses being developed by groups like Smart Floating Farms of Barcelona. These “vertical farms” integrate hydroponics systems with fish hatcheries, allowing for year-round farming on off-shore platforms. It may be a while before anyone raises a flag on a man-made island in the Great Pacific Garbage Patch. But seasteading projects are happening already, and it’s time that our governments recognized their importance — both as scientific and as social laboratories. If we can send rockets to Mars, surely we can invest a comparable amount of money into building a colony at sea. What we learn on either of those missions is bound to help us navigate the other. Photo by Andras Gyorfi, CC-BY-3.0.